The first one I ever saw was maybe at the Greenfield Village sports car show, in the museum on the grounds of Ford’s own nostalgia tour of early 1900s America. That one was red with a white interior with chrome wheels and knock offs. I doubt if the factory made one like that but it was beautiful. This was the mid-‘60s. At the time, after classes, I roamed Woodward Ave. during high school and cruised the car lots as well as the Big Boy restaurant and others, I saw one in a lot, out in the cold and rain, missing bumpers for $4,000. Now that was a cold lead, ‘cause Dan went to Art Center like ten, 15 years previously. But the cars were in Toronto and maybe there weren’t as many 300SL buffs there as in the States. So I called. Alistair still had his car. We made the deal for $4,000. Complicating the fact was that I was temporarily employed by the Gum’mint, wearing a Private First Class uniform (later busted to what’s below that…) I promised $2,000 down and $40 a month. I went to pick it up and of course it hadn’t run for years. This was the remaining one. I didn’t ask him what happened to his father’s car. The one I bought was a dull silver with cloth upholstery, and tartan cloth (I always thought tartan was British, or Scotch…). But what the hey, I loaded it on the trailer I brought and headed for the Bluewater bridge leading from Windsor, Canada to Detroit. At Customs I thought I’d say I paid a pittance for it but wouldn’t you know, some guy there read Road & Track and came out of his hut, which was mid-bridge, to look at the fabulous Mercedes. So they took my name and probably would have investigated if it not for the fact it was New Year’s Day or something and everybody and his brother from Michigan was going over to Canada to buy Canadian whiskey. So, I never heard from them. And there was another wee problem. Alistair Justason, the previous owner, had given me the wrong title, the one to his father’s car. But the cars were one serial number apart so Customs let it go on the theory that some butterfingers mis-typed it (who knows if decades later gullwing nuts ever straightened that out). When I got to Detroit I rolled it out in front of a Mercedes dealer and left them a note, telling them the car “just quit on me” and when they got back to me, they were suspicious, cobwebs on the engine and so forth, but they got it running. It never started very well, just grinded on and on, polluting the 12 (or was it 18) quarts of oil so you had to change the oil again. I drove it around my neighborhood but nobody except a few guys who read Road & Track appreciated it. Sometimes I drove it with both doors open. I took out a memorable Brazilian exchange student in it, but she was not impressed when I couldn’t figure out how to turn on the heater. Another time one of the fixed in place but removable windows fell out, fortunately not breaking. Another time I was barreling down a country road and the aluminum belly pan fell off. I didn’t go back for it (probably would cost thousands to duplicate today). The funniest incident was when I went to the Vinsetta Garage (yes, now a famous place in hot rod world) when it was still a gas station and that’s when it cost $10 to fill your car and there was still gas station attendants. The attendant started looking under the car after five minutes of pumping, wondering why it had passed $10, and wasn’t full yet. He not realizing it had a 32 gallon tank! So he couldn’t figure out how to charge me, the pump didn’t go that high! I don’t recall racing other sports cars, but I do remember when my room-mate, Alan Cohen, said he would pit his Suzuki against me and I blew his doors off (if motorcycles had doors…). Anyway when my pop said I couldn’t park it in our single car garage I couldn’t bear the thought of getting snow and ice on it and drove it to Chicago and sold it to a famous classic car dealer at the time, Harry Woodnorth, for $2,500. The second gullwing came I think in the ‘80s when I was at an auction in Newport Beach sitting in a lounge chair next to a gullwing and wouldn’t cha know it, within half an hour two guys come along, both saying “I have one of those.” The first was a sad sack of a pilot who had lost his job for giving a pal free passage, and his was half completed one, available AS IS for $7,000. The second had a complete car, white, for $8,000 and I bought that thinking I was better off with a complete car (I was wrong, which you will find out). I began restoring it and got a really good silver paint job from a young man just starting out in the body shop business who really did a great job for what, $800? But then I felt I owed my girlfriend the $3,000 I had borrowed to complete the purchase and drove it up to Oakland and sold it at an auction for $11,000. I was frightened at the auction when one buff went by with a friend and said “Look at the gullwing with the 190SL grille” and I realized that the story a chrome plater had told me earlier, of a guy who smashed his gullwing nose and rebuilt it the cheap way was not only true, it was MY car! Owning it was the same problem as before. Starting it was terrible, you grind the starter on and on and eventually smell gas in the oil Then, too, it was hot in Los Angeles and one time I drove it with ice cubes surrounding me and was still hot! The only mechanic who knew the cars backwards and forwards was Walt Pagenstetcher of Poway, down by San Diego, so I’d have to talk a friend into taking it down there, and he would drive the gullwing with me trying to catch up in another car in case I had to leave it. The tragedy of that second cars being sold down the river was that gullwings were just starting to go up. But again I had no place to store it and there was the $3,000 debt (today I’d tell her to go pound sand…). What haunts me today is that, only three hours North of Oakland where the auction was, was a family farm owned by my relatives and it had chicken coops, big ones, bigger than railroad cars, and I could have driven it into one of those and taken the Grayhound home. I even had a dream, decades later, that I had done that, and in my dream I got in the car and turned the key, and it started. Oh, happy day! Oh, hindsight is SO much better. And so it is. 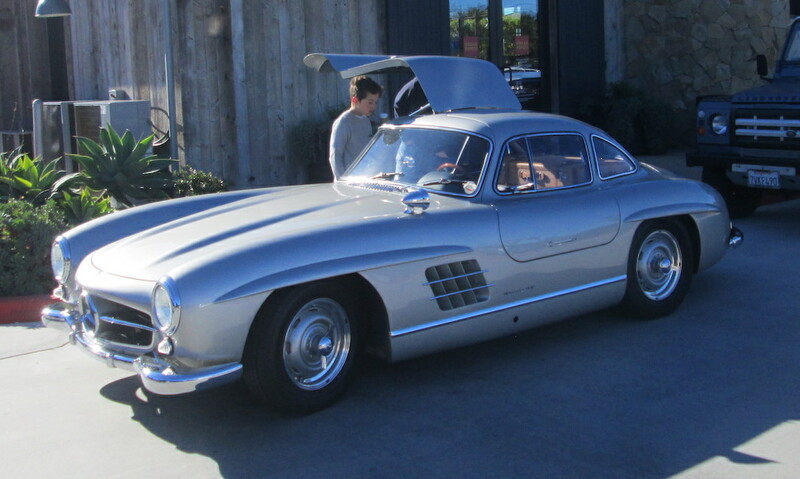 Flash forward several decades and I am in Trancas, Malibu, in March 2018, at the what will probably be the last Cars & Coffee there, and I see a silver gullwing pull up, with blue tartan seats. Is it my old car? I don’t want to know, because it hurts too much…but hey, the good thing was I owned the first one when I was in my 20s and the second one when I was in my ‘40s so I owned them when I was still young enough to enjoy them. Lousy. I would find the car darting left or right when I hit the brakes hard. When I complained (on both cars) the mechanics would say “these type of wide drum brakes were experimental back then,” yadda yadda. Being from Michigan where 327 Chevy V8 engines are as plentiful as deer in the forests, I thought when I first had trouble with the FI slant six engine that an easy solution would be to just swap out for a Chevy. But then I thought since the Mercedes engine was installed at a slant to have a low hoodline this will leave the Chevy engine about 8 inches higher than the Merc. And I’d have to put a cheesy drag racing style funny car style hood scoop. Not so good for authenticity. But dammit–I could have driven the car more! Shoulda done it. The car shown here is not the author’s car…but then again his first one was silver with tartan upholstery….on second thought, he doesn’t want to suffer that “I shouldn’t have sold it” angst. Yet another adventure in owning what would later become very valuable cars that the author sold too soon. YEAH, I HAD THREE GULL WINGS IN THE LATE 60s AND I SOLD ALL OF THEM FOR $20k. HIND SIGHT CAN REALLY MAKE ONE SAD. THEY WERE MY DAILY DRIVER CARS. AS WAS A MASERATI MISTRAL COUPE, 2 EACH 246 FERRARIS AND A 330 GT FERRARI. OH WELL, AT LEAST I CAN SAY I HAD THEM. UNLESS ONE WAS RACING A GULL WING THERE IS NO NEED FOR MORE THAN 8 QUARTS. PLUS, THE OIL RADIATOR SHOULD BE BLOCKED OFF TOO. A VERY INTERESTING FACT THAT WAS LEFT OUT IS THOSE BRAKES WERE MADE UP OF HALF COMPOSITION MATERIALS, AND HALF BRONZE. THE COMPOSITION WAS MOSTLY USED WHEN THE BRAKES WERE COLD. BUT AS THEY WARMED UP THE BRONZE WAS THE CHIEF STOPPING MATERIAL. THEY LASTED FOR EVER. I NEVER KNEW ANYONE WHO REPLACED, THEM DUE TO BEING WORN OUT, EVEN AFTER 125 K MILES. PS; WHEN I SAY” BLOCKED OFF”, I MEAN THE AIR PASSING THROUGH THE OIL RADIATOR, BEING BLOCKED OFF. NOT THE THE ACTUAL PIPING SYSTEM, OFF THE OIL RADIATOR.